"Ceremonial Totem", "Sea Creature", "Balance" and "Zen Shelter"
With her sculpture from the book "The Art of the Birdhouse: Artists and Their Creations"
"First Wish" on left and "Offering" on right. 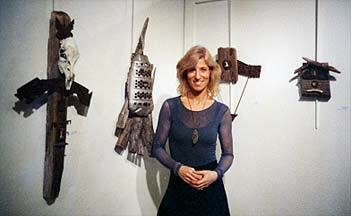 Solo exhibition at The Silvermine Guild Galleries with "Ceremonial Totem" on left and "Guardian" on right. Solo exhibition at The Silvermine Guild Galleries with "Reflections from Provence" . Lucy M. Krupenye, an award winning sculptor, creates wall hanging assemblages out of found objects such as stone, wood, metal and bone. Her sculptures, which range in height from less than 1 foot to over 6 and a half feet high, are very organic and Zen in feeling. Although some are whimsical, most frequently Lucy searches for harmony among the very diverse elements. Her sculptures are often her personal reflections and meditations but they can also represent the physical reflections and counterparts that exist in nature, life and our world. 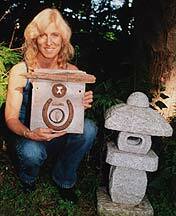 Lucy is very in tune with nature and preserving the environment and she uses a lot of "recyled" material in her work. What most people consider flotsam, jetsam or garbage, she often considers treasures! creations are most commonly inspired by nature, music and the world around her. Her sculptures are a reflection of her soul and she strives to create works of beauty, peace and tranquility in a world that is often surrounded by violence and hatred. 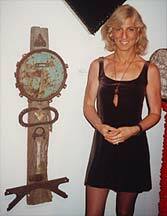 Lucy has exhibited extensively in galleries and museums in the Northeast and New York City. 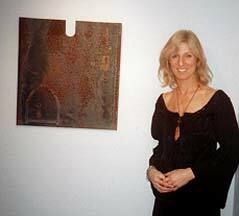 She has had solo exhibitions at The Hammond Museum, The Stamford Museum, The Silvermine Guild Arts Center, as well as in many other galleries. She has been the featured artist in Westport Magazine, in many newspapers, on the cable television program Miggs B on TV and she and her work were included in the book "The Art of the Birdhouse : Protraits of Artists and Their Creations". She has won awards for her sculptures in juried exhibitions and her work is in private collections in the United States and in Europe. 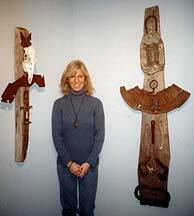 Scroll down for Lucy's statement, gallery of her work, reviews and contact information. Click on her name above to email. 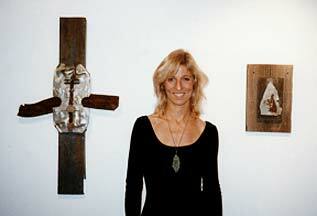 "Lucy M Krupenye, an award-winning sculptor creates assemblages out of found materials of stone, wood, metal and bone. She juxtaposes them and joins them in a very personal rendering of her thoughts and emotions. When used together, the elements fuse to produce an eloquent unity." "The surprising discrepency between Ms. Krupenye's petite, blond, girlish appearance and the totemic sculptures that she creates from found objects, including car parts such as catalytic converters and flattened tailpipes, and even deer bones she finds in the woods, is charming. The sculptor's pieces have an African sensibility that is not entirely unlike the Vigango (Kenyan) totems. Her pieces which all have a sort of warm, protective and motherly feel and shape, bear names such as "Autotem" for one made of car parts, "Guardian" and "La Reine Rouge" or The Red Queen for one made of rusted parts that have taken on a rusty red patina."